Wanstead goes on tour! None of us are quite sure how this happened but at some point on a slow birding day on Wanstead Flats we must have started discussing where might be better than here. Almost everywhere! 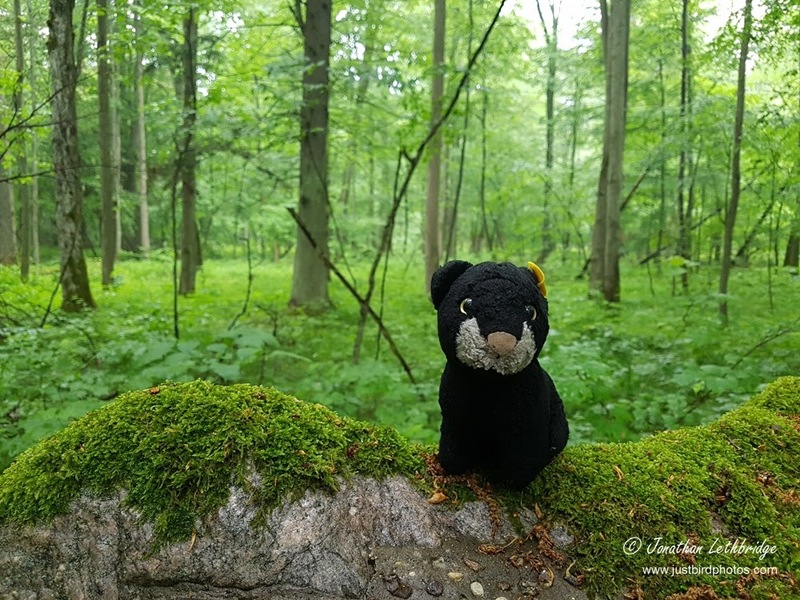 We eventually decided on Poland’s Bialowieza (Bee-yah-woe-vyay-zha) forest – a number of us needed Owls and Woodpeckers, and it was readily doable over a long weekend. 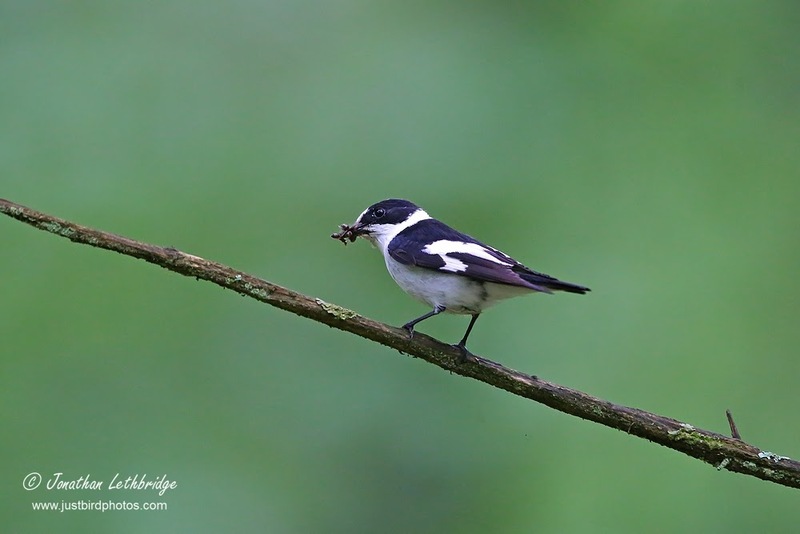 Early Friday to late Sunday in mid-May gave us two half days and one full day birding. Flights from London to Warsaw were about £107 each with British Airways. At the time of booking they were cheaper than any alternatives and the flight times were perfect. We tried to hire a minibus as there were six of us but there were none available so we got two cars and drove in convoy. Well, attempted to at any rate. Per car this came to about £80 rental + £45 fuel for the three days. We drove 760km. Accommodation at the Ostoja Pasibrzuch was shall we say rustic, but a bargain at £12.50 per night per person in twin cells. Sorry, rooms. We didn’t use the pool as it had a dead cat in it. Breakfast however was excellent at about £5. Whilst we were not on a tour, we did contact and book a guide for the Saturday - Arek Szymura. If you want Owls and Woodpeckers you need a guide. In the event his son Mateusz took us round – from 4am to 10pm! €50 per person, which whilst sounds steep is an incredible hourly rate. He knew his stuff and was quite a funny guy, and he also did not let up the pace all day. In addition he gave us good gen for our last morning in the forest. In deference to his livelihood I won't detail the exact locations of his stakeouts. We ate two meals at a restaurant in town. The food was cheap and good but the staff need to work on pretending they are pleased to see customers. 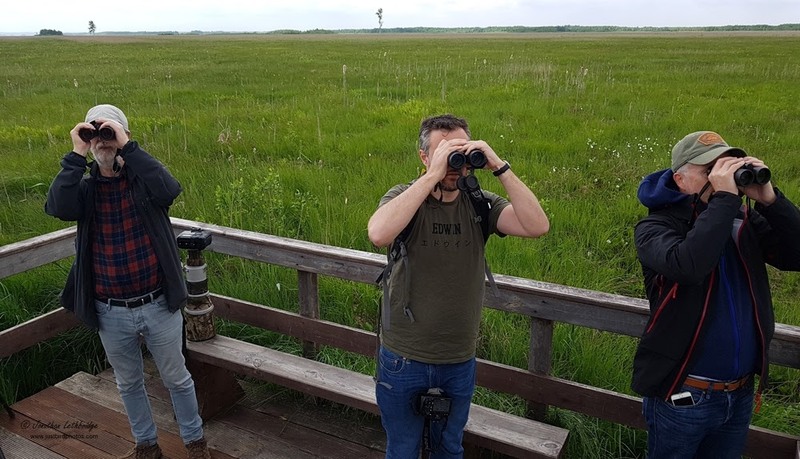 Day 1: 4am wake-up call for a 7.35am flight from Heathrow which arrived at Warsaw at 11am., We were on the road by midday and drove 3 hours up to Biebzra marshes for Aquatic Warbler. It was then a further 2 hours to Bialowieza. Day 2: 3.30am start call to meet Mateusz. Massive day spent in the Bialowieza forest visiting various staked-out breeding sites, with the evening spent in the upper Nawew valley at a Great Snipe lek. 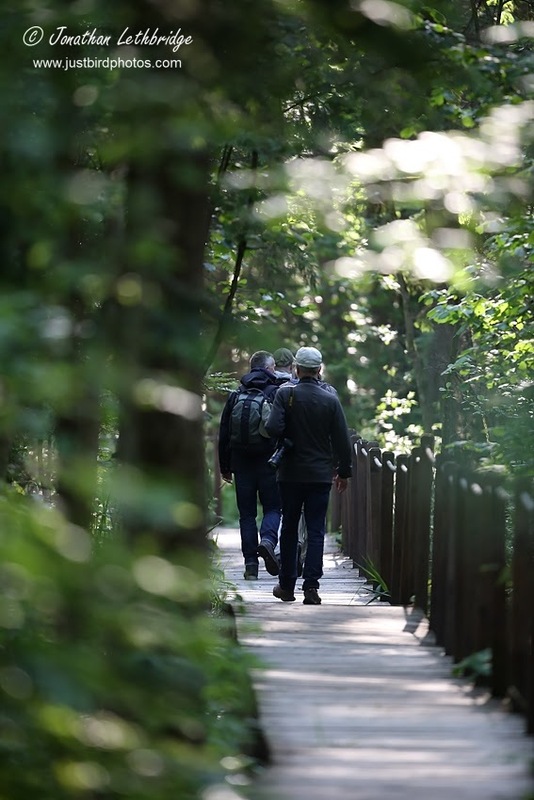 Day 3: All morning spent birding around the forest at a number of sites suggested by Mateusz, and then a cross-country drive back to Warsaw, birding all the way, for a flight at 6.30pm back to London. We attempted to spend time in a Warsaw park for Syrian Woodpecker but spent but unfortunately there was an event on and it was too busy. We left London at 7.35am and arrived in Warsaw at 11am. With hand luggage only we collected the cars very quickly and were on the road by 11.45. In car 1 (callsign: Red Khajar) were me, Bob and James. In car 2 (callsign: Black Pecker) were Tony, Dave and Richard. Naturally our plan to drive in convoy failed spectacularly at the first major junction, and the carefully planned two-way radio back up plan also failed when Red Khajar went out of range almost immediately. From then on we kept in touch via Whatsapp and eventually met up again at the Dluga Luka boardwalk about three hours later. 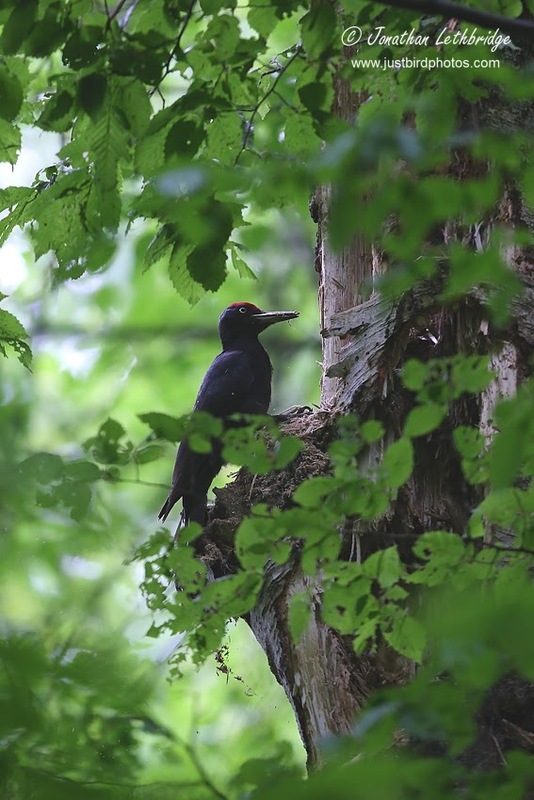 It is fair to say that Black Pecker was navigationally challenged at many points during the trip, notably (and repeatedly) in the very small village of Bialowieza, but we all got back home again. 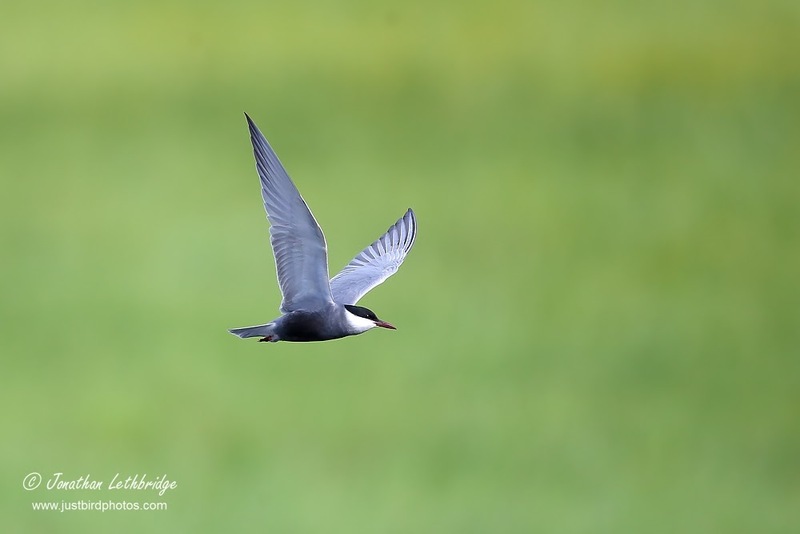 Before leaving for Bialowieza we checked out a nearby marsh tern colony we had seen on the way. 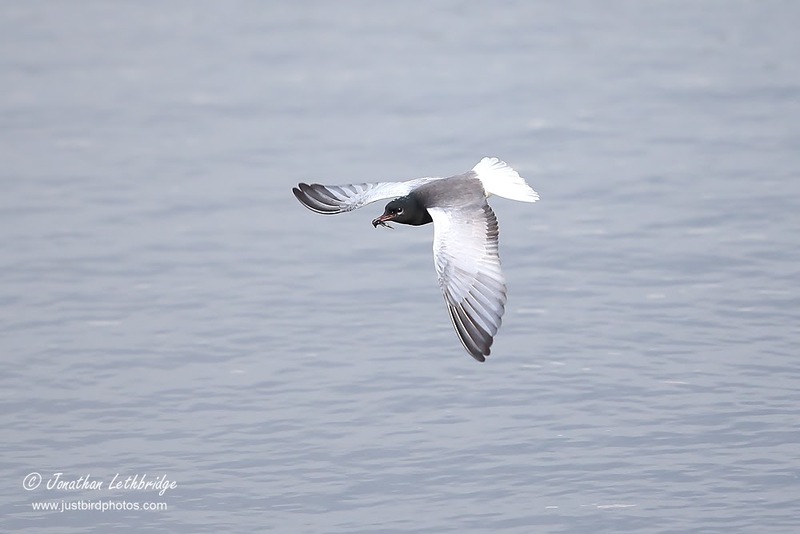 This was excellent, with probably up to 100 pristine White-winged Black Terns, a handful of Whiskered Terns and a solitary Black Tern. We all agreed these were probably the best views we had ever had of the former. Supporting cast here was Cuckoo (present in huge numbers everywhere we went), Lesser Whitethroat and Sedge Warbler. Then it was two hour drive south east to the forest during which we managed to stay together and which passed without incident. Dinner and one too many beers were had at the Pokusa Restaurant, and the vodka shots ordered by Tony were completely incompatible with a 4am start. My alarm went off at 3.30am. Ouch. After a 4am start the previous day this was very hard indeed! Mateusz was waiting in the car park and the five keen birders that had managed to wake up all introduced themselves. Tony shambled up a few minutes later blaming an ill-advised chaser and time zone issues, and then we were on our way! The weather was not very nice, light rain and very overcast, but it was what it was and we all had waterproofs for this eventuality. We did not go far, only to the meadow between the town and the Strict Reserve. 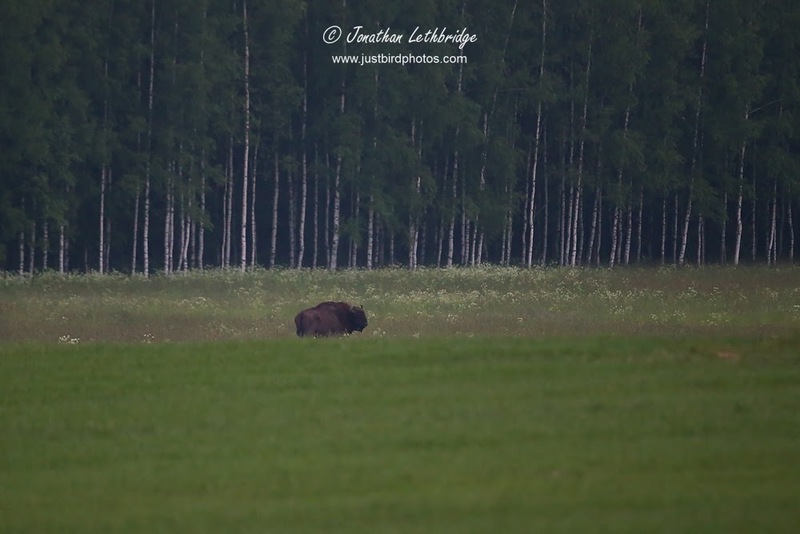 European Bison! A male, albeit not quite fully grown, was feeding in the lush grass close to the forest edge. The scope was pressed into service again and we enjoyed some nice views of this enormous European mammal. 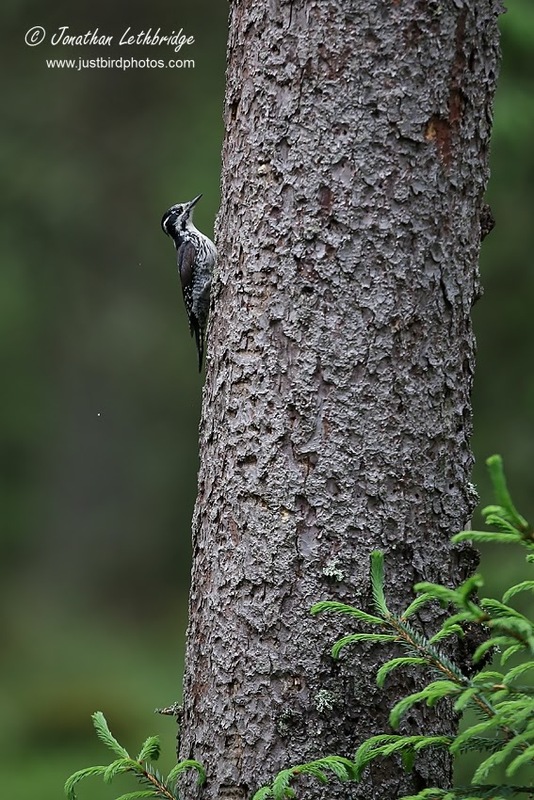 Our next stop was the territory of a White-backed Woodpecker, one of the top targets for the group. It was a fair walk down a forest track followed by a taking a narrow trail to a very boggy area. The bird took a while to show so the resident mosquito population enjoyed an unprecedented feast. Finally it appeared, albeit briefly, but we all saw it pretty well as it came to what was probably a nest tree. 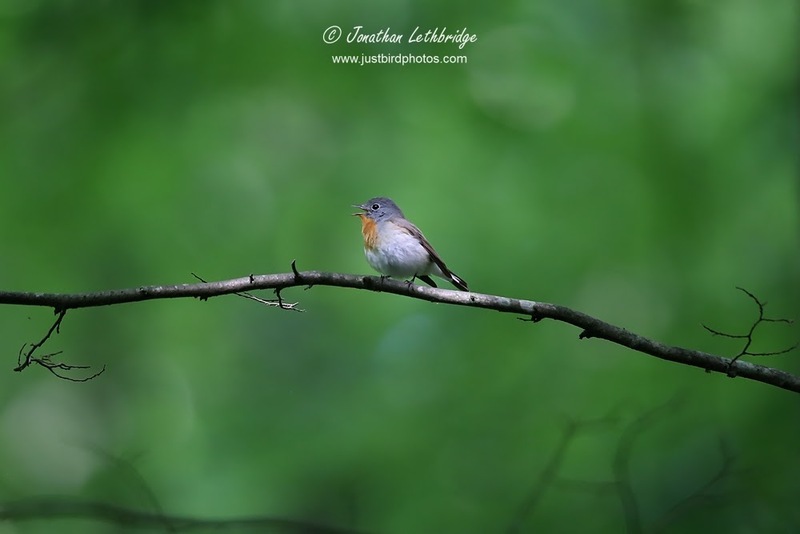 With this under our belts we did not hurry back, and instead enjoyed our first views of Red-breasted Flycatcher, a stunning male, as well as Wood Warblers (abundant) and Collared Flycatchers. Flush with this success we visited a site near Budy for a known Middle Spotted Woodpecker nest. This was a lot more straightforward and we had excellent views of both adults as they came to and from the nest. We also heard Black Woodpecker here but despite it being quite close we were not able to track it down. We had a short break for breakfast before meeting a new guide, Dorotha, at the Bialowieza Strict Reserve. Not quite sure what the deal was here, but Mateusz was double-booked and taking a large group around the same place about 15 minutes ahead of us. A bit off really but it did not make a huge amount of difference in the long run, and we saw Lesser Spotted Woodpecker which his new group didn’t. Win. At the huge entrance gate we were entranced by amazing views of a Black Woodpecker hammering huge chunks of a rotting tree to smitherenens. The ground below had mounds of wood shards, and these were easily the best views I had ever had of this brilliant species. Dorotha was a field scientist with a special interest in Collared Flycatchers so it was appropriate that we also got stunning views of this very numerous species, as well as a lot of good general information about the reserve and its ecology. Middle Spotted Woodpecker and another Black Woodpecker were seen on our long walk round. 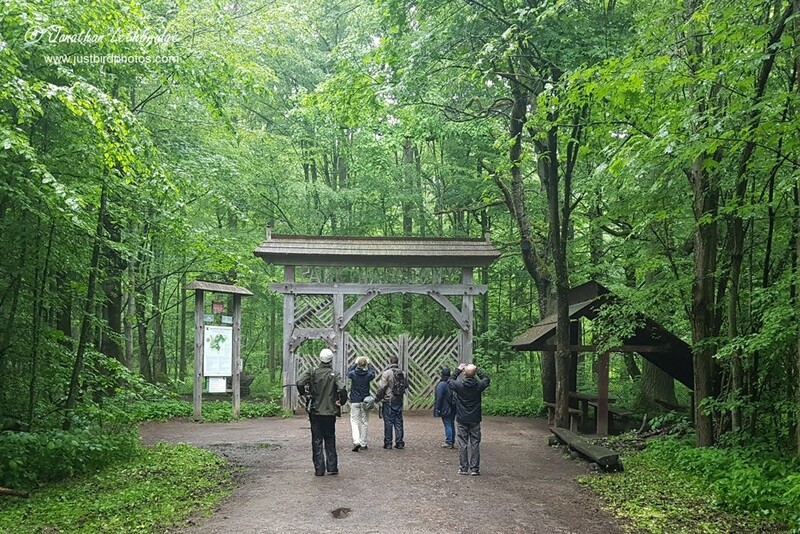 The entrance to the Strict Reserve - the tree favoured by the Black Woodpecker was just to the left of the gate, but it may be a stump by now! We were passed back to Mateusz again at the entrance and then visited his Grey-headed Woodpecker site in the Palace Gardens. The bird was unfortunately not present which didn't surprise me at all. I'd previously dipped it in Lithuania, Finland, Estonia and Greece, so why not add Poland to the list. To console us we travelled to a Pygmy Owl stakeout and scored instantly, Mateusz ran a stick up the trunk to mimic a Pine Marten, and the bird reacted by poking its head out to see what was going on. 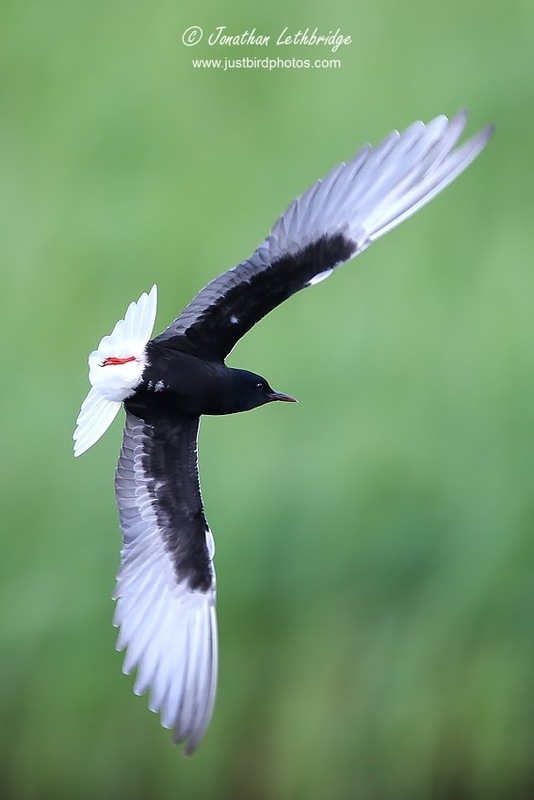 With our scope lined up and ready we all got nice views of this diminutive and tricky bird. It didn’t stop there though! We were soon at a new site near Czerlonka looking for Three-toed Woodpecker, another elusive and much-wanted species for most of the group. Mateusz did not know the actual site, more the general area, but by extreme good fortune and a sharp-eyed Bob bringing up the rear we managed to find the exact tree. Had we been but a few metres further on (or had Bob kept up!) we would have missed it. As it was our guide now has the site and is a very happy man. 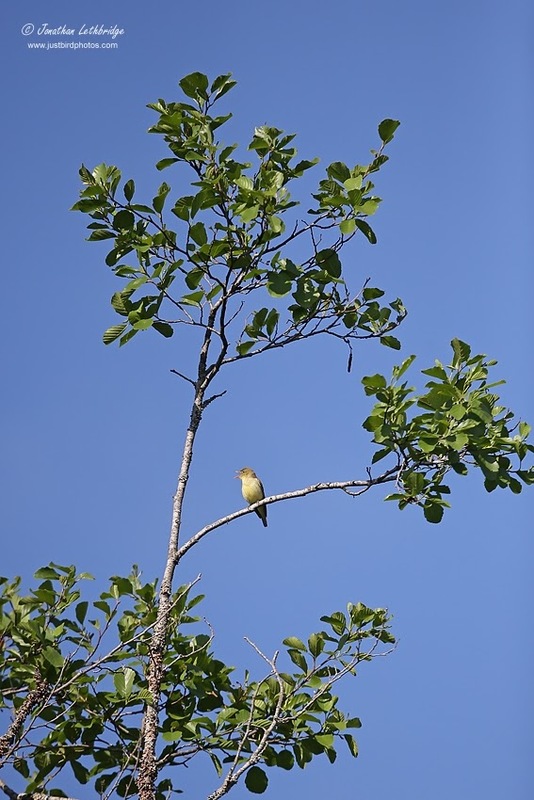 We retreated to give the bird space and enjoyed wonderful views as it came into the nest tree. Three-toed Woodpecker. This would have been a lot better with a 1.4x converter. We were flagging but Mateusz was indefatigable, and we embarked on another huge walk to try and track down Nutcracker and Tengmalm’s Owl. To cut a long story short we found neither. 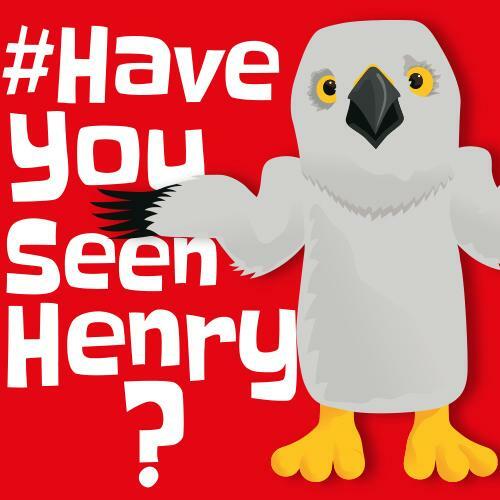 2018 is not a good year for owls and although the Tengmalm’s had been seen earlier in the season displaying at this site it was not present. Rather disappointing to have walked so far for no reward but nothing is ever guaranteed. James actually fell asleep walking back to the car. Before we broke for dinner and well-earned rest we stopped off for a Red-breasted Flycatcher and were treated to close range views of a fabulous male. I’ve seen quite a few in the UK but none have been this good. 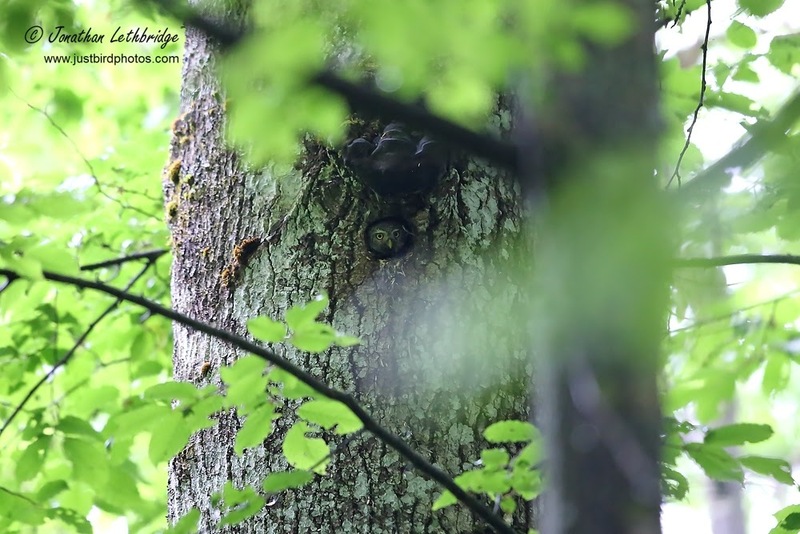 Back at Bialowieza we returned to the Grey-headed Woodpecker nest and this time the bird was at home! 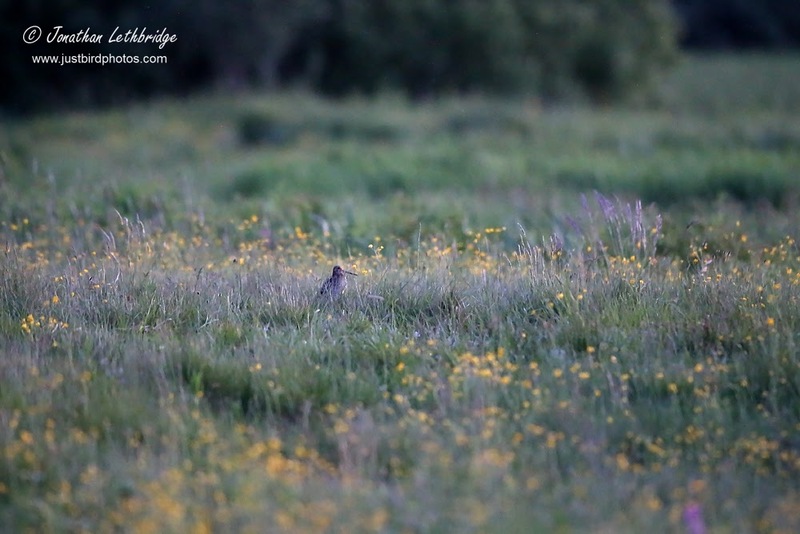 Mateusz whistled it out and it had a quick look around and then flew strongly across the meadow. Finally! At this point (5pm) we were allowed a brief rest, only fair after 13 hours of birding and about 12 miles. But we were not done yet! We quickly dipped Wryneck near the guide’s house before returning to the Gulag for power naps and a quick bite to eat. Then we picked Mateusz up again and hit the road to the Narew valley, about 40km distant. How I drove there and back I have no idea, but we made it and all is well. 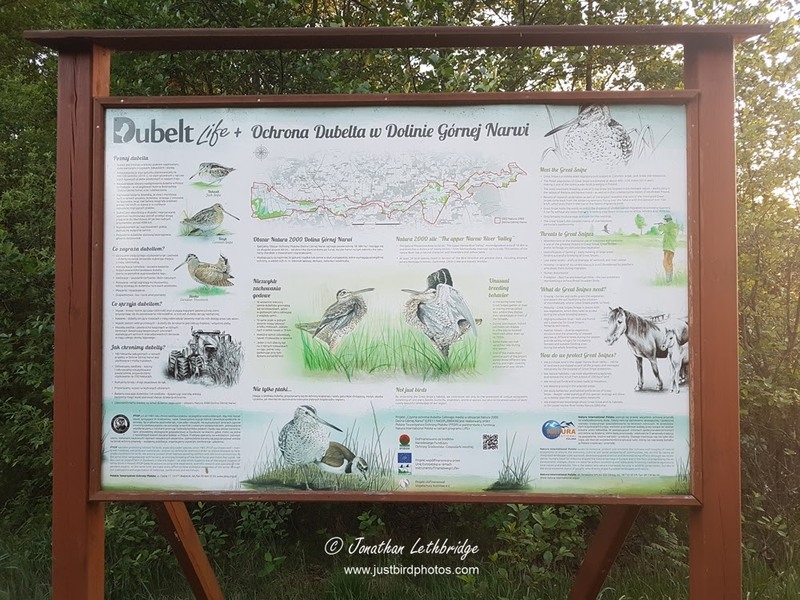 The Upper Narew Valley is well known Great Snipe lek that has received some decent funding to create the ideal habitat. Great Snipe only start to display after sundown and we timed our arrival perfectly. Corncrake were calling everywhere and when they are close they are incredibly loud. Despite thinking we might see one we never did, but it seemed to be at our feet at times! At the area known for lekking we stayed quiet to try and hear the characteristic bill-clacking. Mateusz pointed out a slightly higher area of ground used for the displays, but the actual bird was was spotted by Dave somewhere completely different. In fact it was far far closer and yet again having a scope provided the most sublime views despite the low light. I’ve seen a vagrant Great Snipe at Spurn but it was basically just expiring in a field so this felt a lot better. Supporting cast here included churring Nightjar, Thrush Nightingale, Woodcock and Gropper. 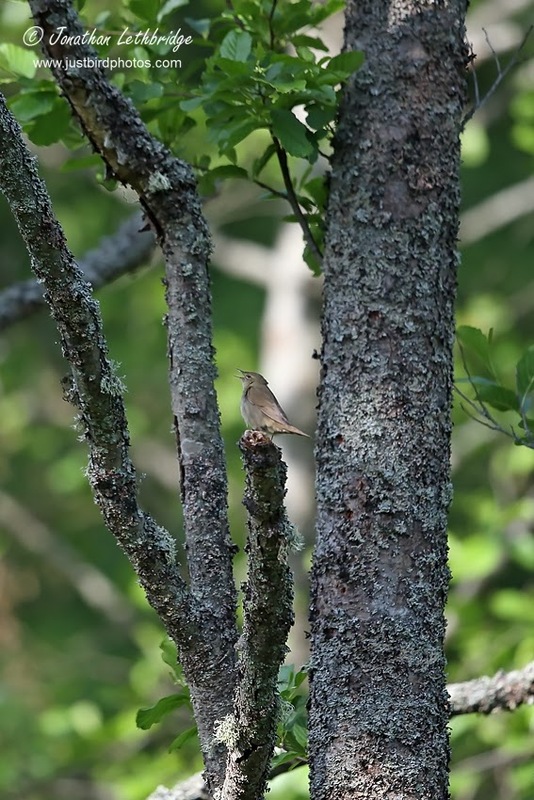 On the way back we stopped at an open area between Bialowieza and Pogorzelca and were treated to a River Warbler belting it out continuously near the tower hide - it must take crazy amounts of energy - the whole bird shakes constantly. Great Snipe - I have lightened this image significantly. Rather disappointed with our nil return, we returned to the River Warbler site from the previous evening and found it singing from halfway up a tree which was a bit surprising. The interminable boardwalk was soon forgotten. 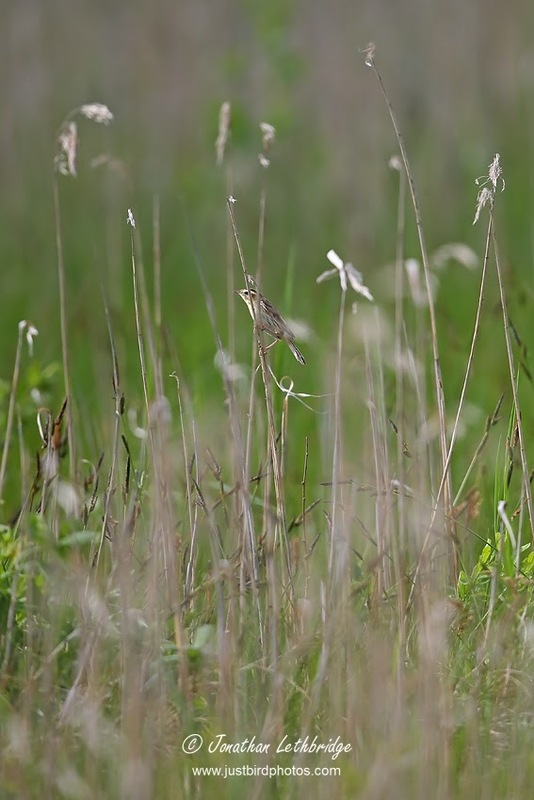 An Icterine Warbler was singing from the same tree, a Black Woodpecker was in the next tree along, Rosefinch was in an adjacent bush, a pair of Red-backed Shrike were in a clump, Great Reed Warbler was in the ditch and a Savi's Warbler was in the opposite reed bed. 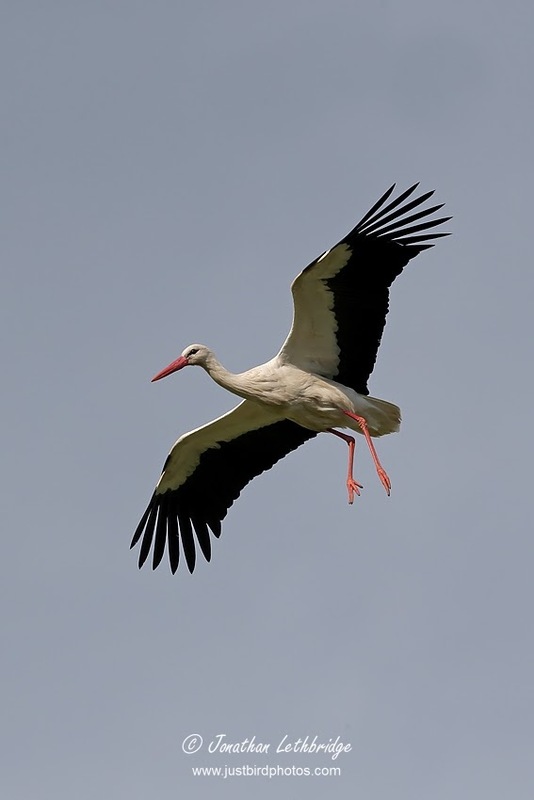 Eastern Poland is simply superb - birding as it should be. If you have never been you need to go, it is mind-blowing. We returned to the village and to the Palace Gardens to try and help Richard tick Thrush Nightingale. 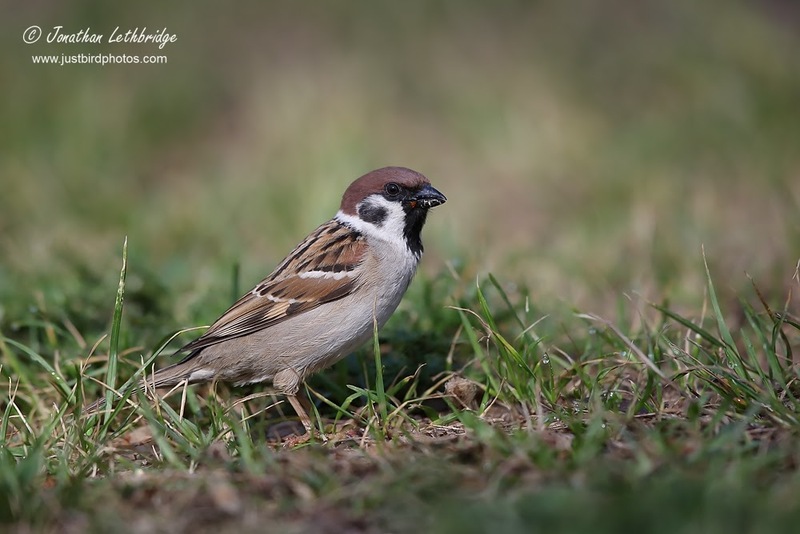 Tree Sparrows a-plenty, Red-backed Shrikes and Great Reed Warblers by the ponds but no joy. Hawfinches and another River Warbler close by, along with yet more Rosefinches and our first Sand Martin overhead. The place is teeming with birds. 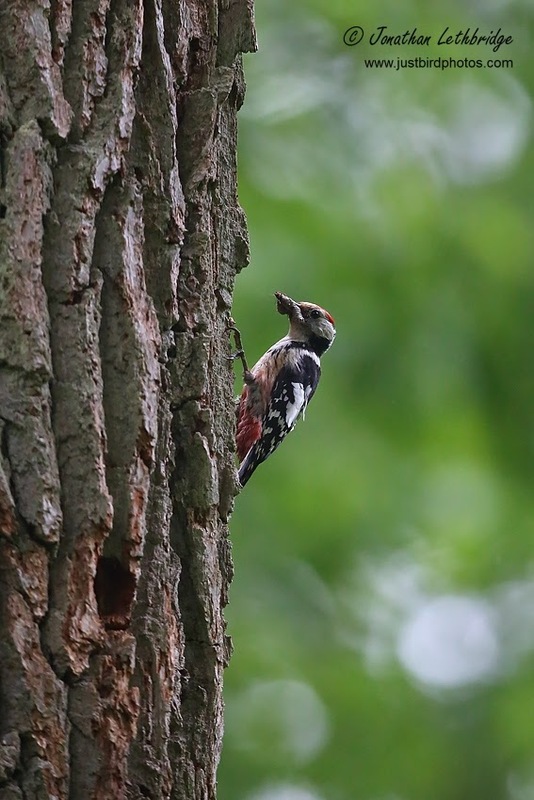 A planned attempt at Syrian Woodpecker in a Warsaw park was thwarted by some kind of triathalon event, so we ended up being very early at the airport for our flight back to London. The collective trip list was 108, and we were all pleased to see that a week long trip with one of the major tour operators cost a grand and only got 160. We spent a quarter of that and saw most of what we wanted to see - Tengmalm's was probably the biggest miss but having seen one in Finland I was pretty chilled on that front. So all in all a fantastic short break - very tiring but extremely satisfying to have spent a weekend enjoying top quality birding in great company. Mammals: Rabbit, Hare, Red Squirrel, Fox, Elk, Red Deer, Roe Deer, European Bison and we heard a Wolf! And to think 800,000 Poles would rather live in Ealing. What an amazing trip! Green with envy. Just self-published a book that I had printed in Poland but probably as close as I’ll get to going there for the time being. 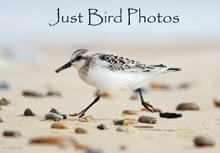 Trying not to read too many posts like this as I haven’t been birding for three months... This book publishing lark has simply been all-consuming. Been worth it but at a cost to my favourite hobby. Happy and sad at the same time!